(Nanowerk Spotlight) Harvesting unexploited energy in the living environment is increasingly becoming an intense research area as the global push to replace fossil fuels with clean and renewable energy sources heats up. There is an almost infinite number of mechanical energy sources all around us – basically, anything that moves can be harvested for energy. This ranges from the very large, like wave power in the oceans, to the very small like rain drops or biomechanical energy from heart beat, breathing, and blood flow. We just need to find ways to tap into these pretty much limitless sources of energy. In previous Nanowerk Spotlights we showed examples of how nanogenerators can be "powered by ultrasonic waves, convert heartbeat and breathing into electricity, and harvest waste energy from a rotating tire. In an intriguing demonstration, Zhong Lin Wang, Distinguished Professor and Director, Center for Nanostructure Characterization at Georgia Tech, and his team, have now demonstrated that the technology offered by nanogenerators can also be used for large-scale energy harvesting. This work, published in the January 29, 2013, online edition of Nano Letters ("Toward Large-Scale Energy Harvesting by a Nanoparticle-Enhanced Triboelectric Nanogenerator") represents a mechanical energy-harvesting technique – a triboelectric nanogenerator – which effectively converts ambient mechanical energy into electrical energy. "The working mechanism of our novel nanogenerator does not fall into the category of established conventional transduction mechanisms for mechanical energy harvesting, i.e. electrostatic, piezoelectric, and electromagnetic," Wang tells Nanowerk. "Instead, energy generation is realized through the coupling between triboelectric effect and electrostatic effect." He explains that, unlike electrostatic generators such as dielectric elastomer generators, the triboelectric nanogenerator does not require to be “jump-started” with an initial voltage before they can produce power. Instead, the triboelectric effect gives rise to contact surface charges that act as inner “driving force” for the motion of electrons through external circuit. This characteristic offers significant advantages including low cost, simple fabrication, and small volume. 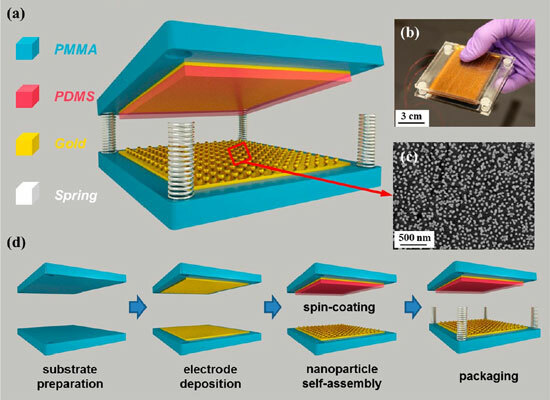 The triboelectric nanogenerator device fabricated by Wang's team has a layered sandwich structure with two substrates of PMMA on the outside. On one side, a layer of contact electrode – which plays dual roles of electrode and contact surface – is prepared, consisting of a gold thin film and gold nanoparticles coated on the surface. On the other side, a thin film of gold is laminated between the substrate and a layer of polydimethylsiloxane (PDMS). The two substrates are connected by four springs installed at the corners, leaving a narrow spacing between the contact electrode and the PDMS. "Firstly, the cost of materials is insignificant in comparison with other conventional mechanical energy-harvesting techniques. It does not involve synthesis of crystalline materials nor require certain materials that generate magnetic field. All components of the nanogenerator are commonly commercial products on the market. Although it uses gold in the design, extremely little amount is applied, only 50 nm in thickness. Besides, other non-precious metal can also be used as replacements. "Secondly, very little amount of materials is consumed. The nanogenerator has a thin-film based structure. Besides the two metal electrodes (both 50 nm in thickness), the other material, PDMS layer, has a thickness as small as 10 µm. The small size not only further saves the cost of materials but also indicates excellent scalability of this technique. "Last but not the least, the fabrication is straightforward without sophisticated tools and complicated process flow. Therefore, in terms of cost, there stands little hurdle for widespread use of the nanogenerator." The improvement over other types of nanogenerators is not limited to the simplified and low-cost fabrication, though. Wang's novel nanogenerator also delivers an unprecedented high electric output efficiency and power density. "The proper selection of materials enables excellent tolerance on defects from materials and fabrication process," explains Wang. "The elastic property of the PDMS layer ensures that the entire surface area is fully utilized. Moreover, we applied nanoparticle-based surface modification on contacting surfaces of nanogenerators for the first time. It functions both physically and chemically, giving electric enhancement of at least 25 times compared to nanogenerators without modification." Triggered by commonly available ambient mechanical energy such as human footfalls, a nanogenerator with size smaller than a human palm can generate maximum short-circuit current of 2 mA, delivering instantaneous power output of 1.2 W to external load. The power output corresponds to an area power density of 322.7 W/m2 and a volume power density of 37088.1 W/m3. Wang points out that, at device level, the overall efficiency of the nanogenerator reaches 9.8 %. If only energy forms that participate in conversion process are taken into consideration, the direct energy conversion efficiency can reach as high as 14.9%. "We attribute the record high power output for our nanogenerator to optimized structure, proper materials selection, and nano-scale surface modification," says Wang. The team demonstrates an application of the nanogenerator on a large scale, simultaneously lighting up as many as 600 commercial LED bulbs simultaneously at an estimated output open circuit voltage of ∼1200 V. In this case, the current pulse output was produced by human footfall, i.e. stepping on the nanogenerator. "We suggest that the mechanism demonstrated in this work can be utilized on large scale to harvest mechanical energy from human footfalls, rolling wheels, wind power, and even ocean waves," says Wang.